Whether you are a Real Estate Wholesaler, Fix & Flipper, Homeowner looking to sell your house, a Real Estate Investor honing your skills, or a Real Estate Agent looking to be sharper at comping properties, you will all find value in this article. Ready to rock? Let’s go. What Does Comps Mean In Real Estate? Let’s go over the comps definition for real estate. “Comps” is short for the word “comparables.” Real Estate Professionals use real estate comps to appropriately determine the current house value estimate of a property, and also the future house value estimate of a property. Until recent years, we used to have to rely on Realtors & Appraisers to use real estate comps to determine the house value. Thanks to technology, we don’t need to necessarily use Realtors & Appraisers to determine the value of a house anymore. Quick note: There are many words & phrases used for finding comps. We know how Real Estate Lingo can get confusing so in order to steer clear and not confuse you, let us point out the most common phrases used for finding real estate comps, that essentially, all mean the same thing. All of these different keywords and phrases boil down to the same thing: using past historical sales data of real estate sales to determine the current or future value of a property. Why Do I Want To Find Real Estate Comps For My House? First off, you may want to find real estate comps to determine your house market value in order to sell you house on the market for the best price possible. By finding real estate comps and getting comparables for your subject property, you will be able to determine how much it is worth on the current market today. This is powerful because if someone gives you an offer on your property, you will be able to know if it is a good offer or not! No more guessing and crossing your fingers while hoping you have a good offer for your property! Secondly, you can use real estate comps to find the FUTURE house market value of your property. Why Would I Want To Determine The Future Value Of My Home? Great question! You want to determine the future value of your home for a couple reasons. Let’s say you want to renovate your kitchen & bathrooms to sell your home at a higher price. Well, how do we get the home estimate of what your home will be in the future? By using real estate comps. You actually look at the renovated comparable properties in your area to determine what the future value will be! If you ever wonder, "What adds value to my house?" Then, you can look at the renovated comparable properties around your house to see what the value-adds they have and the prices they sold at. From this little experiment, you are able to deduce which renovations can add value for the future price of your home / subject property. For Real Estate Professionals (especially investors), the future value of a property once it has been renovated is usually called the “ARV.” ARV stands for “After-Repair-Value,” “After-Renovated-Value,” “After-Remodeled-Value,” or “After-Rehabbed-Value.” Once again, Real Estate Professionals use all of these words & phrases interchangeably! Before we show you the Real Estate Skills Way for finding comps, let us make it absolutely clear that you DO NOT need a Realtor / Real Estate Agent to find real estate comps for you. How Do I Find Comps For Real Estate Without A Realtor? So, what’s the Multiple Listing Service? The Multiple Listing Service is the database of ALL houses on the market in your area! Not just active properties, but hoards of SOLD properties, which are comps that you need to determine the house value. The MLS was created by real estate professionals in order to have a database of property values and to effectively show all the properties on the market. The MLS in your area is accessible through an online database with usually 2 main ways to get access: 1) Being a licensed real estate agent/broker, or 2) Being an unlicensed real estate assistant. The Cons are that the MLS is not easily accessible as other forms of getting comps. Also, it is not necessarily free. Typically, it costs about ~$25 a quarter (every 3 months) for unlicensed assistant access, and can be more expensive than that if you are a licensed real estate agent or broker. The MLS is KING when it comes to finding out information about a property because it has been updated for years by real estate professionals who are experts in your area on the real estate valuations. By utilizing the MLS, you can look up past historical sales data to easily find comparable properties. A lot of Multiple Listing Service systems have sophisticated tools for finding comps, such has search & filtering functionality, radius tools to easily look up comps around your subject property, and alerts to be notified if specific properties have any changes in value, sell, or get under contract. Referring back to the quote from Wikipedia, typically public real estate websites try to pull & retrieve their information from the MLS to populate their websites. Once again, this is why the MLS is the best when it comes to finding comps because its data is the most complete when compared against public real estate websites which can have impartial information. Even though, public real estate websites like Redfin.com, Zillow.com, and Realtor.com may not have as much data as the MLS itself, the public real estate websites are easier to access than the MLS. The Pros definitely outweigh the Cons with the MLS making it the best paid way to find real estate comps online. 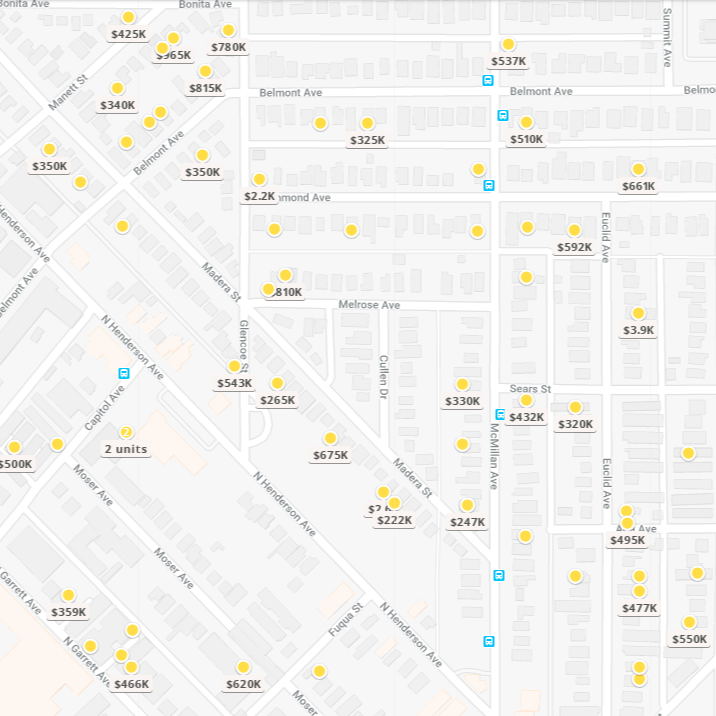 These are public websites you can use to access historical sales data in your area/neighborhood, and to look up real estate comps around your subject property. If you do not have access the MLS in your area, then the websites listed above are phenomenal secondary resources for finding your comps! How To Look Up Real Estate Comps? Let’s say your subject property you are analyzing is a 3 bed / 2 bath 1,200 sq.ft. property and you want to find the ARV (After-Repair-Value) to determine it's future value. Go into your MLS system, or use one of the free public real estate websites listed above, and look up the search criteria/function. 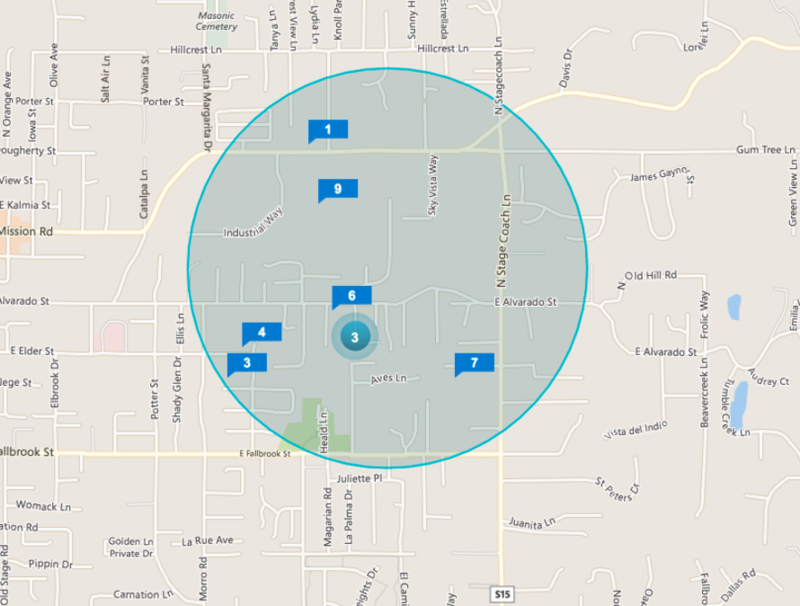 From there, type in the address of your subject property and pull up a half mile radius around the property. Then, in the search criteria, modify the search so that you are only looking for SOLD properties within the past 6 months. We do not want to initially be looking at comparable properties that have sold outside of 6 months. This means if today is July 1st, 2018, we would only want to look at SOLD properties from January 1st, 2018 to July 1st, 2018. In the search criteria, make sure the initial square footage you are looking for comparable properties is within +/-20% of the subject property. In this example, the subject property is 1,200 sq.ft. - this means you would only look for properties that have SOLD in the past 6 months between 1,000 sq.ft. & 1,400 sq.ft. Additionally, you do not want to use comparables that have a different bed and bath count than your subject property. Since your subject property has 3 beds 2 baths, you want to find comparable properties that are also 3 beds / 2 baths. From there, you will now begin to see all of the "comparable" properties within a .5 mile radius around your subject property! Now you use the comparable properties that have been renovated to current market trends to determine the future sales price of the home for your subject property for when it is renovated! For example, from using the Real Estate Skills Comp Criteria, let's say you find a 1,112 sq.ft. 3 bed / 2 bath renovated home that sold at $390,000 two months ago on the same street as your subject property. And then, you also find a 1,300 sq.ft. 3 bed / 2 bath home that sold at $410,000 1 month ago on the same street as your subject property. Now what you can do is take the average of those 2 comparable home sales and determine that your ARV will be right around $400,000 for your subject property once it has been renovated, given is the 1,200 sq.ft. 3 bed / 2 bath property used in the example! And, there you have it! It is not much more complicated than that. What makes a true real estate professional who is great at using comps to determine a house value is someone who continually practices finding comps. You will get better and much quicker at analyzing property using this method over time. Once you have this skill honed, you will be able to quickly & accurately analyze property for your company and clients. We've been asked a lot to make a handout with the Real Estate Skills Comp Criteria, so we made it into a PDF just for you. Now you will always remember how to find real estate comps in your area! You can download the Real Estate Skills Comp Criteria Cheatsheet for free here. What To Do If There Are No Comparable Properties From My Search, Or Not Enough Comparable Properties To Get An Accurate Estimate? Keep in mind that the less "comparable" a property is to your subject property in terms of square footage, location, bed/bath count, and features; the less it should be used as a complete accurate representation of the future value of your subject property! 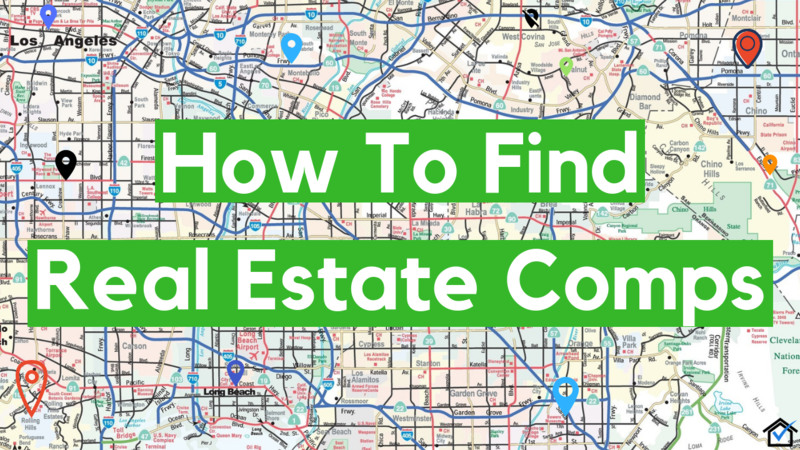 A lot of real estate professionals wonder "How Do I Get Better At Finding Comps?" Our answer is that nothing replaces actually DOING THE WORK. You get better at finding accurate comps the more you use this method of finding comps. Over time, you will get a better eye for seeing why properties sell at certain prices and where your subject property will sell at! Be sure to review the section above constantly for finding comps. The Real Estate Comp Criteria is the method that we & our clients and students use to accurately analyze property to determine its current or future value. So, maybe you've heard about real estate appraisers or realtors finding comps and have some questions about this, as well. Before we wrap up, let's get those questions answered! How To Find Real Estate Comps With An Appraiser? An appraiser is a professional you can pay in order to get the current value of a real estate asset. Appraisers are commonly used by banks & lenders to find the value of a home in order to make an informed decision whether or not they should lend on a property via a mortgage. Thankfully, from reading this article, you now understand that you can use the MLS, or free real estate websites (like Zillow.com or Redfin.com above) to get an accurate value estimate without having to pay an appraiser. How To Find Real Estate Comps With A Realtor? You can also use a Realtor, Real Estate Agent, or Broker to find real estate comps for your subject property. Usually, the real estate professional will compile the comps into a data sheet called a "CMA." CMA stands for Comparative Market Analysis. CMA's are commonly put together at no charge for homeowners who are using a Realtor's, Real Estate Agent's, or Broker's services for buying/selling a home. There you have it! At Real Estate Skills, we commend you for reading the full article on How To Find Real Estate Comps To Determine The House Value. You now know that you can find real estate comps for the current value, or future value, of a property for Free! The Real Estate Skills Comp Criteria listed above has been used to analyze property effectively for real estate investors, professionals, home buyers, & home sellers for years. We recommend you use the Real Estate Skills Comp Criteria for finding your real estate comps! In fact, we made a PDF handout of the Real Estate Skills Comp Criteria so you can print it out, review it with your team, and keep it handy so you never forget it! Click right here to download the Real Estate Skills Comp Criteria Cheatsheet! In order to be notified for more insightful skills, how-tos, interviews, discussions, and tips, be sure to subscribe to our email list below. Don’t worry, we won’t spam you! We’ll just send real estate golden nuggets to help you develop the skills to achieve your financial goals through real estate. Cheers To Your Success In Real Estate!